24 entertaining physics experiments will again be offered this year under the motto “24 more experiments until Christmas” in cooperation with the University of Göttingen, the Wilhelm and Else Heraeus Foundation, the German Physical Society (DPG), the Austrian Physical Society (ÖPG), the Swiss Physical Society (SPS) and the European Physical Society (EPS). Many great prizes can be won. “PiA – Physik im Advent” is an Advent calendar of a special kind: a physical Advent calendar. Behind every little door there is some education and fun. From 1st to 24th December, small physical experiments that can be carried out with standard household materials will be presented every day as videos by Mr. Santa or Ms. Santa. Participants do the experiments and answer a question on the PiA website. On the following day, there will be a solution video and, if the answer is correct, a point. At Christmas, all participants will receive individual certificates. Among the best participants, prizes will be raffled off in the categories of individual, school class or school, for which numerous donors have donated in cash or kind. In addition to iPods, books, and experimental kits, there will also be a trip to Dallas to watch NBA basketball games with Dirk Nowitzki. Anyone who registers can participate. Registration is free and opens on 1st November, PiA starts on 1 December. Posters and flyers can be requested free of charge via the contact form on the PiA website. 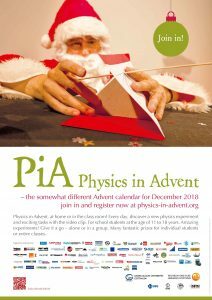 “PiA – Physik im Advent” is aimed at children and young people aged between 11 and 18 years, and will take place for the sixth time in 2018. Last year, a new record was set with 31,000 registered participants, 49% of whom were girls, and 1.5 million visitors overall.